We’d love your help. 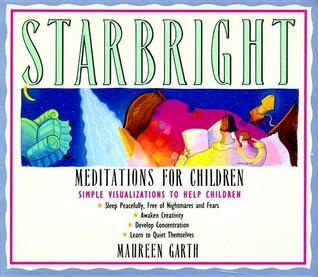 Let us know what’s wrong with this preview of Starbright--Meditations for Children by Maureen Garth. Driven by the desire to help her three-year-old daughter settle down into a peaceful night's sleep, Maureen Garth devised meditations that would help her daughter feel secure and cared for. Starbright is a collection of the stories Garth created as her child grew older. These innovative meditations are simple visualizations parents and teachers can read to their children t Driven by the desire to help her three-year-old daughter settle down into a peaceful night's sleep, Maureen Garth devised meditations that would help her daughter feel secure and cared for. Starbright is a collection of the stories Garth created as her child grew older. These innovative meditations are simple visualizations parents and teachers can read to their children to help them sleep, develop concentration, awaken creativity, and learn to quiet themselves. "Unfortunately, a lot of children have trouble learning these techniques by the time they are seven or eight," writes Garth. "Relaxation and visualization, if taught at an earlier age, could enhance not only children's school work but other areas of their lives. Their concentration would improve; their artistic abilities would develop; they would feel more centered; their daydreaming could not only bring joy, but be constructive." To ask other readers questions about Starbright--Meditations for Children, please sign up. I read my son this book every night- last thing. My friend recommended this as her son (in Henry's class) loves it and now Henry has to have his meditation every night! I tell him it helps him have sweet dreams, and a lot of times we have fun expanding on the meditation and making up new stories to tie in with them. I would think every child would love this!! I was read these beautiful short stories as a child and recall them sending me off to a peaceful and magical sleep each time. Heartwarming, well written and of course well read to me by my mother, the stories are enchanting and rich. Highly recommended for children, will read this to mine when I have them some day! This is basically a book about how to get children to relax. My special needs + ADHD daughter actually loved it when I'd read parts of it to her at night. Some of the meditations are too long, but I would just read part of those. A great idea, but not a perfect execution. I read this book to my boys at night (aged 3 and 5). They love it. The times when they lay still it really seems to help them fall asleep, in particular the 5 year old who has ASD and difficulty falling asleep. A very dear book for children. Contains some truly helpful guided meditations, which I used to do with my sons when they were little. Very comforting. These meditations for kids are so good that adults can use them profitably, too. As a child very prone to nightmares my mum used to read this book to me almost nightly. Nowadays I read it to my 4yo niece when she stays over - she refuses to go to sleep without her "garden story". Recommended for all kids - and adults who fancy a gentle bedtime story.